For the first time, I have a turn an officer of my neighborhood association. As you know, an office of neighborhood association is likely to more depressing than that of PTA. Of course, I also feel depression, however, it is a kind of "prison time", when I live anywhere. But I feel easy, because I become a "press officer" in the neighborhood association. In addition, no problem happens even if I ask someone to make Web site maintenance. "This association might be good for me"
"A person who speak longer, is poor"
"A person who cannot speak concise, is dummy"
And I also know that the older they are, the more terrible their speech becomes. "I have to change the recognition of neighborhood association"
To tell you the truth, I think that many of head of junior, junior high ,and high school are "poor" and "dummy". In the place of entrance ceremony and graduation ceremony,which are big stages for them, their tired speeches are beyond saving. I think that the tired speeches are for their age, and I also have to be cautious about my speech. It would seem that that is my big misunderstanding. From now on, I will tell you some stories of this association, and finally I confirm that I will show you one of two conclusions, as follows. "I had been a great help"
"I had destroyed the association"
because of past disasters of mine. When GW starts, I am watching "Three Kingdoms" in YouTube. "All authors who write a book, whose title "Company management learning from Three Kingdoms" are stupid. Only people who can aim for the heavens have "overwhelming", military force, intelligence, or psychopath. So, such people will definitely not read such as "book learning from Three Kingdoms". They don't need to read it. There is nothing to learn from Three Kingdoms. Today, I was doing repair work for a veranda at my parents home. 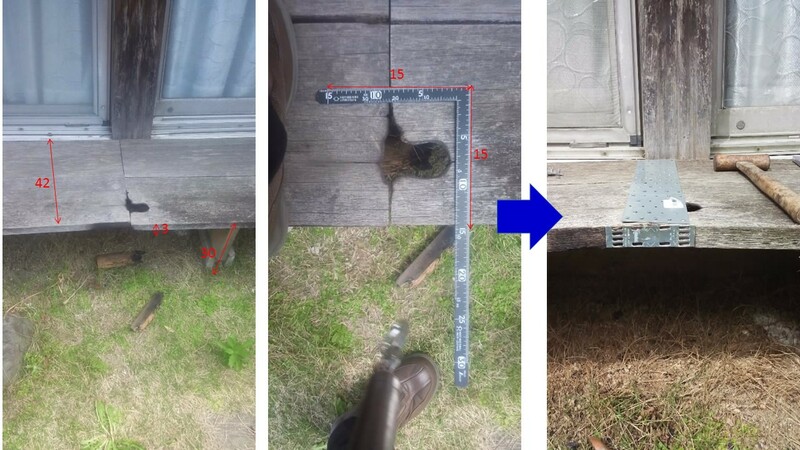 When I looked under the veranda, there were traces that were already repaired many times. I thought this time, I would do over all of them, however the quality of the wood was good, unexpectly, so I hesitated it. "If I replace it with SPF material, the time to be broken will be reversed quickly", so I decided to repair this time as well. I like to repair broken things, like this. For example, (as I mentioned before), our home security system is almost composed of junk (or gift). "Frankly speaking, it is big nuisance"
First of all, "shopping alone" is the best for me, and malls never make my wish. "Please drop only me down to the DIY shop"
Any business entertainment annoys me at any time. Well, I think that there are some reasons why I can not be promoted. I am using a smartphone for data communication only(no voice). I use a data SIM of 500 yen per month, low speed data communication, however, you can enjoy YouTube so much. Even if it is said to be a "smart" phone, it is mobile personal computer, after all. I am an engineer who loves location information technology to had filed a couple of inventions on GPS. However, I have escaped my notice of application of GPS (like car navigation). Ultra low speed, data SIM of 500 yen per month. Why can it realize functions of natural rerout, bird view display, auto map expansion and reduction ? It seems like a magic. "Smartphone is a car navigation system"
For me, the above is necessary and sufficient. After misrecognition of my country house address, the service have never misunderstood the address. About a care geriatric health facility where my mother stays, this service showed the correct place on the map with just saying the common name. "Automatic washing machines let women corrupt"
I remember that I wrote about a stupid old-aged woman, who said the above. "Smart-phones let human being corrupt"
I almost say the above, and I am confused. I cannot deny what I thought that. After reading ultra famous novels "Three Kingdoms", whose author was Yoshikawa Eizi-san, I had read comics "Three Kingdoms", whose author was Yokoyama Kouki-san after getting a job. The comics didn't hit my heart, and I had been apart from "Three Kingdoms". About two years ago, I began to recollect little by little with Toukou Jun-san's comics, "Komei's wife". And in the last few weeks, I completely reignited on the drama 'Three Kingdoms'. "Like the flow of a river -- Story of Sun Tzu"
Thanks to this book, I came to read "The Art of War". Indeed, I proposed to the editorial department "I want to serialize with The Art of War by Sun Tzu" (It was true). After all, it was gone off (rejected). "Learning from Sun Tzu, a strategy to survive alone in life -" Art of war for alone"
Please contact me if you can offer series or publications. If possible, I hope that two of the following will come true. After a series of "a wife of Kongming", a wife of Chutatsu(Sima Yi) will start. A real wife of Kongming doesn't appear on the drama "Three Kingdoms". However, a wife of Chutatsu doesn't appear on the drama, who was a director of the state (? ), continue a mission quite considerable and was a person who came to be innocent death. I think that 's pretty interesting. On the other hand, I am afraid that few people knows "Chutatsu". "Kongming, who had died, set Chutatsu flying. is very famous for many people. I think that I would like to approach something from this phrase. I could not make something good (irresponsibility). Setting up two displays of my personal computer at the kitchen table and watching a video program, I can enjoy making dishes. I was watching movie news for the whole GW period. However, there were three accidents due to erroneous driving by elderly people, as long as I remember. There is a movement to "raise the rule for renewing driver's licenses for the elderly", but this movement doesn't work well at the moment. I can understand the reasons very well. Because cars are definitely life-lines, as well as water and electricity. "To not move freely" means directly to death. Because they cannot even purchase food. Especially for elderly people who have difficulty moving body freely, if they enforce to lose their car, they are likely to be ordered "wait for it to crawl on the spot and die." Furthermore, to the citizens who have not yet caused an accident, Even though a nation has power, it is probably the exercise of power which is hard to break to make a license expire as a precautionary measure. Some people say easily "It is good for relatives to return their license", however, I am afraid that they don't know how difficult this is, because they don't encounter the scene. In my case, I was able to activate violent enforcement measures against my parents. "beyond the red line" made me the decision. "live their daily life to care of cars, which zoom through gates of hospital and convenience store"
Technologies, for example "auto (stop) driving technologies", might resolve this problem, however, in the present, nobody knows whether the technology works well in our society. Today, I want to propose "a society that is not based on using cars". However, I have already said that cars are equal to social infrastructure, so it might be difficult to make cars disappear. So, I propose to eliminate "updating system of driving license" and to start "expiring system of driving license in five years". After expired, any people in Japan, should go to a driving school again, and take examination of both practical and paper (and perceptual disturbance). Due to this system, many elderly persons must lose their driving license. But all people will get a fair deal absolutely. Above all, it is up to them, because they cannot pass the examinations. Of course, this measure will reduce numbers of automobile in Japan, and give destructive damage to Japanese automobile industries. In addition, the gross domestic product might be going down dynamically. Moreover, when the measure were proposed, any ruling party, even if it is a big one, is going to be minority opposition party soon. However, I want to ask you for the question heartlessly. (A)Daily life to make a fence to avoid involving someone in fender bender. (C)Daily life to go to a driving school every five years. I cannot accept "Neither one". We all have the potential to rush into the entrance of convenience store and hospital or children's school road, and we can not escape from the fact. "You will come to know it soon"
In units of months or weeks, coming at violent momentary instant --- the ultimate fear of "aging". Anyway, it is strange that a driving license of automobiles, which can be a device for killing people, is "life license". Those which owes to the benefits of cars, I think, should take care of this annoying, no matter how much troublesome. I'm pretty serious, that "This is not a time to be taking TOEIC"
The other day, the last person, who had never wanted to use smart-phone, (it's me), has fallen. Now all the Ebata's become smart-phone users. "Communication fee is free, whenever you use your smart-phone for data communication under the wireless LAN environment(except for voice communication)"
"If you have high-speed Internet lines to your home, you can use that at home." And I think the smart-phone has been able to realize the ("obvious", so called) paradigm. (I have already told you the same story again and again, however), The Ebata's house is digital fortresses that the Ethernet cable runs in the house, even in the outer wall of the house, and in the ground of the garden. was printed in my mind. I purged "Wireless LAN" in my house, and, at the same time, I started "large-scale installing of wired LAN" as a historical background. However, since only my senior daughter used a smart-phone, I could not abolish all of "wireless LAN". So I installed a small pocket-sized WiFi AccessPoint(AP), sticking to the leg of my desk and started non-stop operation. In addition, in my wife's country house, a voice of "we need wireless LAN environment" has appeared. With such an increase in "smart-phone party" at the Ebata family, the amount of data communication by the wireless LAN becomes higher day by day, and it is no longer to support the communication by the pocket WiFi access point. On the other day, while I was working in my office, I received an instant message "Wifi stops now" from my wife.The pressure to wireless LAN in our house has risen gradually. After all, I yielded to pressure. Recently, I ordered a permanent Wireless LAN access point (AP) to Amazon.com, and it arrived last night. Tonight, I will install it with changing location (As mentioned above, The Ebata's house has a wired LAN everywhere). Security measures are also important for wireless LAN, so I am afraid that the work will be tough. "Democratization through wireless LAN by all the Ebata family" is steadily progressing. When I was young, I was learning the piano, and I did (could) not read the score. I remembered I heard the piano teacher's playing, copied it ear, and took it for the next week. However, I still think that "I wonder why that piano lesson was so painful." In order for finger work smoothly, I was ordered a training to continue to play the same score again and again. Needless to say, it was nothing more than pain. "I don't want to become a professional pianist"
I thought so at the time, and I think too. A good skier is likely to take a beginner to a difficult slope (intermediate level or higher). And, the good skier "helps" the beginner to "hate skiing", like reversing the cart and the horse. I mean, a feeling of "I want you to love skiing" leads to the worst result. In another case, a good cook is likely to make a dish of eggplants and carrots for a junior high school girl who dislike eggplants and carrots, (hereinafter the same). both a strong feeling of "making someone happy" and acts based on that feeling, are to "become unhappy with someone"
"the feeling of "making someone happy" is arrogant and outrageous"
"using this guy for making me fun" is subordinate and selfish. Well, if continuing the logic, we can reach to the following story. a guardian who continues to say "Study soon!" Applying this relationship to the above conclusion, "the guardian is always wrong" might to be right. However, I think that the guardian is not applicable to the logic. That means that the behaviors of guardian is not based on "making their child happy". It is based on "to not make their child miserable"
"They want to save their child life, against the child's enemy"
That is a --- frantic defense instinct. The guardians have continued to observer the brutally world in their life. (1)This world is under control of the people who are or has been studying. (2)The people have frozen heart brutally against a person who are or has been studying. Guardians themselves are living their daily life in abandoning "people who do not study" in their society ruthlessly. If not, they can keep their life with you. You, who is a nonworking dependents, never forget the next. Your mother and father, who are providers for you, are doing a simulation in their mind. "If my child becomes my subordinate in my office, what do I do ?" "Well, I don't need her/him"
After thinking that, your mother and father will abandon the subordinate. Don't forget that your mother and father will discard the subordinate for your caring. It is not for you, that your mother and father continue saying "Study" to you. It is for your mother and father themselves, that you will be thrown away from society. However, your life is yours, of course. You have a free and a right "to be truncated by society at my own risk". There is no problem, because it is yours. I think you can have a chance to conflict against society. In addition, Human is a right of not only "to be happy" but also "to be unhappy". On the other hand, I believe that you don't have a freedom to frighten your parents. Your parents are parties who are providing free environment to live your. Even if you were not born with your own will, I think that it lacks a considerable balance of interests, to give "suffering" to parents who guarantee your survival. This story will result in my opinion as I have said before. "You don't have to study, but pretend to study"
If everyone can become happy, do not you think it is a very cheap cost? Also, this "pretending studying" in itself, will be reckoned. A famous animation character says that "pretending can eventually turn into your reality." If "the pretending becomes a start switch for studying", it is also good too. dislike to be criticized by other people than myself. Last fiscal year, I submitted a paper (conference paper) to the international conference, and the review result returned this weekend. My paper was accepted (rarely rejected), however, a pile of criticisms were written and returned. To tell you the truth, I am depressed now. Only salvation is the comments were written in English. (Because I can not read the line spacing in English). Well, I understood that their criticisms were reasonable, however, I think that I want them to criticize me with "gentle words" more. It is good for me to be able to live in the world. As much as possible, I try not to disturb the world of academism, to live quietly in the corner. Thank you for your consideration, in advance. The next "Over the AI", a my series of column, I am going refer to "Big Data"
I had a bad experiment about "Big Data" in my work. About my description of "Big data", I will show you my negative sense. There are a lot of excellent engineers in the world, who open their programming codes they made by themselves without stint(in many case, they are free). These source codes are called "open source". "Open sources" are adaptable for several computer operating systems, and other people can improve them. In addition, we can make a new software based on the source codes. I think that this "open source" movement is an firm evidence for being "good will" in the world. The codes are difficult to read out for me. I want to ask the engineers who open their codes in the world, though I know well that my request might be rude manner for these accommodating persons. I really want to read such incomplete codes. Those codes are, in many case, fundamental function of the algorithm. For me, the code is better for me than complete and completed source code by far. A shorter code is helpful to understand the basic algorithm. Especially, about a code that implements realtime processing function, the old code, before implementing the process, is extraordinarily fine, for me. If the realtime process includes, the code traces must be difficult. If they say "source code itself, is a manual" to me, I don't argue against them. Because it is a just argument absolutely. Above all, I also open my source code to the Internet, but I have not made the manual since now. "Please leave your lame, unmade and short code under the construction"
"Too big is not good"
The bigger objects are, the more difficult they are observed and managed totally. My main work is to research something ( I am a "research engineer"), so I often read several books and materials simultaneously. associating between these several information is too difficult for PC or smart-phone. As a result, I am sorry that I have to install many display on the wall, and waste the electric power. In my room, an opened Note PC is attached on the wall. my wife said "like opened and dried fish". "Too small is not good"
The smaller objects are, the more difficult they are observed and managed totally. "each of them is not good for human being"
"we have to embed USB I/F on the back of our neck, and connect our brains with computer systems"
might be the last method, I think. I am not an aggressive riot security police of Interior Ministry, however I also want it. When I was a college student, I was asked a tutor. I think that these kind of talks are irreverent, however she was a girl of a junior high school student who was somewhat disappointing and non-intelligent. She could not give a greeting, not talk to people according to the condition, and not pretend to act (pretending understanding or not). She might be called so-called "communication obstruction (communication disturbance)" however, I do not know the definition of this word nor usage. Though It might be a uncomfortable story, children with good grades, basically, will have the communication skill normally. However, all of them are not children with good grades (parts of them may be just a petty person). Anyway, I set my expectation at 50% and I was on standby. When I entered her study room, my expectation felt down dramatically from 50% to 0%. On all the walls of her room, a pile of male idol photos and posters were sticky. It is completely free for you. For me, it is the same situation. Personal computer, IoT device (EtherCAT slave, Raspberry) and books (from 4 manga to the white paper of the government) are scattered in my room. my rude prejudice against idol fans. Even I was a college student, I was able to recognize it. On the other hand, this "prejudice" is fairly incomprehensible. It was undeniable fact that there was fluctuation in my job (just part-time job) by prejudice. This was the lowest and worst qualification as a tutor of "performance grading contractor". So, I abandoned my willingness for teaching(Because this story is really persistent, it is omitted below). "in order to eliminate prejudice, it is necessary to thoroughly investigate an object of the prejudice"
I think, thanks to being a weekend writer, I could dispel various prejudices (of the part). The prejudice against "doujinshi" "Hatsune Miku" "sexual identity disorder" "human train injury", had disappeared irreversibly, by investigating lots of materials or interview for the people. "Why can I say that?" "I would like to continue to support the persons in that situation in the future"
And at the same time, I realized that the energy to dispel the "prejudice" needs enormous energy than I imagined. In order to dispel the "prejudice", the thought of "Do not dispel prejudice" is not enough at all. I cannot get over my prejudice, without preparedness of diving into the prejudice pool or spending much time of my life. However, I don't want to enforce you this my opinion at all. When my junior daughter's room door opened, I saw a lot of pictures of characters of "BakeMonogatari" on the wall. "These are splendid art works"
"Idol picture" made me feel of fear, but "Bakemonogatari's pictures" made me feel of "splendid"
I am afraid that The above my behavior was extremely "unfair", and I began to start this topic. Recently, a minister who said "it was lucky for us that the 2011 big earthquake disaster happened in Tohoku-area", had to be resigned from the cabinet. Many people had blamed him, from the viewpoint of impudicity or lack in common sense with feeling of outrage. "Well, this person have already been broken from the beginning"
I think a minister is a kind of a computer system, that have high performance information processing. And a cabinet is a System of Systems(SoS) that are composed of autonomous distributed computers. To begin with, the person who has become a minister, have a sharp mind. Because she/he can operate enormous informations at supersonic speed with their human network. I think it is almost correct to make them "computer systems". "I don't care of them at all"
It is enough for me that they are working for public welfare or my private profit. Therefore, the reason I thought "this minister has already been broken" is that I judged "this computer system has already broken". "he could not have made the thoughtless phrase absolutely"
"Broken Super Computer", that could not fulfill the primary duty. This is my understanding about him. I don't blame and criticize any "broken object". Even if he is a broken computer, it will work well, based on new OS, software or other missions. However, from the view of his previous works, I am afraid that it is not software problem, but hardware drawback( qualification in himself). "Scrap it" might be better. My senior daughter, who has been a college fresh young this year, introduced me a book "How to walk for a college fresh young"
The education system of colleges is perfectly different from those of before colleges, so I think the book like this might be helpful for her. Ebata(E):"It is good. this book will make you ease"
D:"Well, worrisome phrase, you said. What does it mean?" E;"Um, These authors had already graduated from colleges and now they are member of society aren't they? E:"I think any people can speak their own past events after the graduation. It is just a review of their life"
E:"The newcomers are now running about in confusion in the jungle, without no information of where to go, and what to do. E:"I think, these authors are the jungle's observer who live in a space stationary satellite. E:"For a college fresh young, the reports from the satellite, in addition reported in several years ago, is really useful ?" D: "Do you want to say that this book is not useful at all?" E:"I think it is useful for you. However, if you breathe a sigh of relief, it might be dangerous, I am afraid. This book doesn't cover all risk of your campus life"
D:"What should I do on earth?" E:"Let me see.... "prepare yourself for the worst", after all"
E:"These authors wrote their own failure stories based on their campus life, and I believe that this book is useful for your future accidents"
"However, you could not avoid all your troubles in your future campus life. as might be expected"
E:"Ultimately I think, even if you do preadjustments or come to be watchful, you should show your disreputable appearance to others, finally""
E:"Numbers of disreputable appearance seem to be equal to numbers of college fresh young, I think"
We all cannot run away from the fact. Reading the last diary back again, I think that my comments are very hard though, this book seems to be very useful. To tell you the truth, I know the reason. "Only one" than "Number one"
Previously, I wrote the similar story in my diary, using a song whose title "Only one flower in the world(maybe)", and I said that this song is also the most dislikable song of mine. This time, I will tell the same logic to you. First of all, it is is very easy to realize "only one". Because I can explain the reason from the viewpoint of simple theory of sets or claims of patent application. (1)"A device with function A", or "Set of A"
(2)"A device with function A,B,C, and D" or "Set of A,B,C, and D"
There is no double, that is more acceptable as a patent right, or which is smaller set. I mean, the restriction of invention elements or range of set will realize "only one" easily. For example, I am "only one" in the world, who has a name "Tomoichi Ebata" and works as an engineer. Well. well, I know well. "Your definition of "only one" is not only irrelevancy on conventional wisdom, but also desrespectable sophistic"
I want to ask for the difference between "number one" and "only one". (1) "Only one" is just a subjective illusion that doesn't have quantitative or qualitative assessment criteria. That means, the flower that only he/she believe "one flower in the world"
(2)"number one" is just an objective reality that enable quantitative or qualitative assessment criteria possible, and everyone can admit that it is a supremacy. That means, the flower that the world recognizes as "one flower in the world"
Even if "only one" of the above (1) is recognized as social values, all of the "only one" are "number one". In this situation, this controversy is coming soon. "We can use the word "only one" by the evaluation criteria based only on our own view." Then, it is better to say the followings from the beginning. NOT "Be "only one" than "number one"" BUT "Be more self-satisfied that Evaluation of others"
NOT "only one flower in the world" BUT "I, who are alone in the world"
However, I don't deny the existence of "only one". ecause, I know there is a "only one" person I have never met before. When a people want to aim to be "only one", the people fail to become "only one"
There are several respectable "only one"s around me. However as far as I know, they don't know that they are "only one". Moreover they don't aim to be "only one". All they do is what they want to do, and they never give up doing what they want to do. They never give up what they want to do, they do on their own, and they arrive at the goal "in result". That's all. In addition, they don't have any idea of "they are in competition with others". I know the above thought is only my personal observation, however, we can share the same thought with you by observing behavior of winners of Nobel prize(physics and chemistry fields). Many of the winner, often said "I could breathe a sigh of relief, because I think I can continue my study for a certain time. At least, I could not find the winner who seems to be boasting by handing out the Nobel Prize. They didn't aim to be "only one". They became "only one" when we noticed it. This is my own definition of "only one", however I believe this is correct. "Only one" than "Number on"
For me, I want to say to a college fresh young. "Feel hard alone on the edge"
"Struggle against your obstructions, and keep it running"
"I don't know the world think to you, only I will say "I love you like that"
I will keep saying, again and again. I am an owner of the Internet Domain "kobore.net". Now, getting the Internet domain name on individual basis, was not rare case. However, before the Year 2000, it was quite unusual for individuals to obtain domain names, not corporations. I decided to use ".net" instead of ".com" because it was just a thought that I tried a communication provider within my fellow. In addition, I felt ".net" is cooler than ".com" (no basis). I got a mail a few days ago. We just wanted to let you know that domain KOBORE.COM is being released back to the market. Since you own KOBORE.NET, we believe that you might have interest in securing KOBORE.COM as well. If you are interested, please CLICK ON THIS LINK to get more information and confirm your interest. In short, it was sales,"Do you need "KOBORE.COM"?" Previously, using the domain name containing the famous famous department store name and doing adult video sales site etc, there was a business to sell its domain name to a famous department store at a high price (legal at the time). I thought it again, I can not deny the possibility that people appears who confuse 'kobore.net' with 'kobore.com', to aim destroying my credit, or selling 'kobore.com' to me at a high price . Even if I do not plan to use "kobore.com", it may make sense to acquire that right. But I do not have such extra money. If that person appears, I will make a fuss, and I am going to plan and implement a strategy that will raise my famous "kobore.net" notice. Now it is no exaggeration to say that "Amazon.com" is a lifeline of our family, In fact, the utilisation ratio become higher day by day. In my case, I often purchase communication or computing devices (hub router and Raspberry Pi, for example). Therefore I don't need to care of the design of product. Contrary, I will care the performance, usability and error rate of incidence. I should rely on the evaluation of purchaser. In the case of Amazon.com, There are two way, "number of star" and "purchaser's comment"
They can decide the number of star. One star is the lowest evaluation and five stars is the highest evaluation. And the purchasers can add their comment without restrictions. However this "without restriction" annoys me, because the decoding of comments are very difficult. For an evaluation system, like above, a room for "fake" comment is large. Basically, the comment must be subjective. Even both bad and good of evaluation, are likely to guide a principle of "large number"
Therefore, I think I should prepare myself for the worst, that is "I don't expect the correct and fair evaluation from this system". (1)Firstly, I read the comments of the lowest. (2)If the comment includes "shortage of the skill of purchases" or "awful response of the call center", I will ignore the comment. (3)In opposition, I will care the performance or bug of the product, for example "I have to put the reset button frequently"
(4)If the number of the evaluation is large, I think this product is O.K. Because large numbers of purchase are reliable. (5)Despite the above (1) - (4), if the low number of evaluations exceeds the high evaluation number, we refrain from purchasing. Even if it may be judged incorrect - in fact, I will not be bothered by it. For example, (5) above may be a malicious organizational obstructive work, but I am not a judge, or a fair trade commissioner either. I do not think that it is shamed to be influenced by rumor, and I have no high spirit of "true authenticity". However, about what I understand, I cannot be influenced by any harmful rumor. For those who "This doesn't work" or "the support center's explanation is unkind and unpleasant", I think that it is a little cruel to blame with saying "You should read the manual properly". I understand well, that it is difficult to put hands on for those who do not know the basic principle of PC and network to set them up. In the first place, I think that setting up wireless LAN access points by themselves is quite unreasonable. However, neither MEXT nor school authorities move at all. In the Web writer's world, we can get PVs(Page Views), even when we make a title of "How to speak English". This is not open secret. I also try to get PVs. "How to speak English" is very easy. It is "Just speaking English"
If you don't care "they seem not to understand what I am talking"
That's all. It is easy. Many people want to say "you are kidding", however I am serious. When I transfered to the U.S. I could not but doing this way. Unfortunately, the condition has not changed at all until now. If you stop regarding "any communication should be interactive" as mere, I think that my opinion is be to the point. In addition, there are a lot of one-way communication considerably. A candidate on the roof of campaign sound truck doesn't look to hear the audience opinions. My diary and column are extremely very one-sided one, and few people has argued against them.